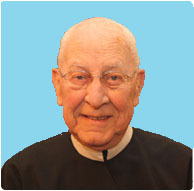 Redemptorist missionary, Father Gerard Schreiber, remembered most especially for the twinkle in his eye and his ever-present smile, died September 13, 2012 surrounded by prayers from the members of his family and his religious confreres at the St. John Neumann Residence, Stella Maris, in Timonium, MD. Father Schreiber was born on November 8, 1928 in Baltimore, MD; professed his first vows as a Redemptorist on August 2, 1949; and was ordained a priest on June 20, 1954. He attended St. Mary’s College, the Redemptorist Preparatory Seminary, in North East, PA, completed his novitiate year in Ilchester, MD and finished philosophical and theological studies at Mount St. Alphonsus in Esopus, NY where he was ordained. Father Schreiber’s first missionary assignment began in 1956 at Campo Grande in Brazil. Two years later he assumed the responsibilities of teacher and eventually superior at the Redemptorist minor seminary in Ponta Grossa where he served for eleven years. In 1969 he became the rector of the Redemptorist major seminary in Curitiba where he again served for almost another decade. In 1978 he transitioned from formation ministry to parish ministry but maintained the responsibilities of superior for the community in Telemaco Borba. His final parish assignment in Brazil was to serve in Miranda in Mato Grosso do Sul. Having spent nearly the first 24 years of his priestly ministry in the foreign missions, Father Schreiber returned to the United States where he continued working in parish ministry at St. Wenceslaus in Baltimore, MD and at St. Anthony Parish in Lancaster, PA. In April, 1981 Father Schreiber moved to the Provincial House in Brooklyn, NY as consultor to the Provincial. In addition to this official office he also accepted the added responsibility of serving as a Vocation Director for the Baltimore Province. In 1984 he relocated to another borough in New York City where he continued to serve as a province vocation director along with the additional work of preaching missions from the Immaculate Conception Parish in the Bronx. In 1989 he continued his extraordinary preaching ministry for the next four years from the upstate New York location of the Redemptorist Retreat Center in Esopus. June 1993 found Father Schreiber — now a member of the Vice-Province of Richmond — once again assuming the responsibilities of superior for six more years as the rector of Holy Family Retreat House in Hampton, VA. He continued to serve in the Chesapeake Bay area in both parish ministry at St. Joseph’s Church and retreat work at Holy Family until 2007 when he returned to the Baltimore Province to assist with some parish duties at Our Mother of Perpetual Help Church in Ephrata, PA. Finally, on June 22, 2011, he began to bring his apostolic ministry to completion, through recollection and prayer with his religious community, when he moved to the St. John Neumann Residence at Stella Maris.